Stonehenge, A Riverside Lodge, Conference and Team Building Venue. We understand that the key to successful conferencing is simplicity, service and flexibility. All our conference rooms are well equipped. Let us make your Company’s next Training, Meeting or Staff Team building session both professional and enjoyable. We have the best conference staff that is skillful, accommodating and guest-oriented for the best experience. 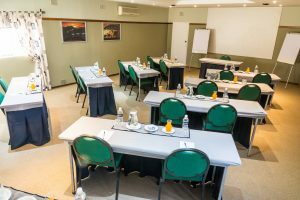 Conference facilities includes: 5 air conditioned conference rooms and can seat up to 368 delegates in comfort depending on seating arrangements. Standard Conferencing equipment in our venues are TV & VCR, O/H Projector, Flip Charts, White Boards, Markers, Water, Mints and Cordials. 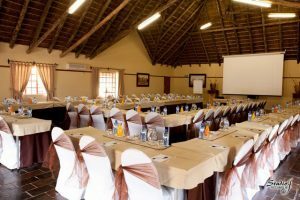 We can put together a tailor made Conferencing or Teambuilding package that will suit your company needs. Come to Stonehenge for the best Conference and Team Building Venue in Parys.